Paddy Power Live Casino is one of Ireland’s biggest, online casino and Live Casino. This online casino, as well as their land-based retail outlets range throughout Ireland, Northern Ireland and Great Britain, Dial-A-Bet departments, and more recently a Mobile division. 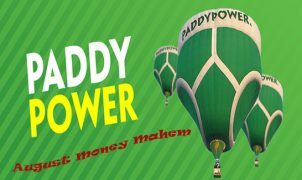 Paddy Power was founded, and still remains based in Ireland, making this online casino especially attractive for UK players. Their bookies can still be found throughout the UK, helping you to feel more at home at this online live casino. Paddy Power started in 1998 as a merger of three existing Irish bookies. The company took an unconventional approach to betting, and offered greater value and fairness to customers, who naturally appreciated the more favourable betting experience. At the turn of the millennium, they decided to start up a website, and have only grown from there. Paddy Power live casino uses their Irish roots to create a pleasant, traditional online casino, while remaining innovative and modern. Their Paddy is suggestive towards Saint Patrick (famous for St Paddy’s Day), and their green colour gives you a lucky four-leaved clover throughout the site. While this online casino offers many different types of betting opportunities, it is still more focused towards sports betting than live casino. Having said this, however, they still do place the right amount of focus on live casino games on offer. Therefore, our live casino players will not feel let out here. Offcourse they also offer online casino slots if you need a break from playing live casino. The website Paddy Power Live Casino, is operated and controlled by Paddy Power Isle of Man Limited, a wholly owned subsidiary of Paddy Power plc. It is registered in Ireland, with a licensing jurisdiction of the Isle of Man. Entering the Paddy Power Casino website first brings you to the Sports section. Betting on all sports is possible here, which returns them to their origin. Looking further, you can find the link to their casino and live casino games. While the overload of links and buttons might be rather overwhelming, their use of categories, and sub-categories makes this site more enjoyable to navigate through, so you don’t get lost. The Live Casino link brings you directly to the live casino offer, with an enticing background, granting you a real VIP feeling. By simply clicking on the games you wish to play, you will be sent through to the live casino lobby, where you can pick your table. The Live Chat of Paddy Power is always available on the right-hand side of your screen. This will open a popup, where you can find the multiple contact options. Their live casino is available 24/7, and you can also contact them on their freephone UK landline for more information. You can also call them in regards to playing bets. You can also always send them an email, to which the customer service will respond as soon as possible. Paddy Power’s Online Live Casino is open 24 hours a day, 7 days a week. They have a wide variety of live casino (Live Baccarat, Live Casino Hold’em, Live Blackjack, and Live Roulette) and other casino games such as 12 Roulette table games, 9 Blackjack table games, and 11 Video Poker Games). The live dealers from PlayTech are neatly clad and have a professional appearance. Unfortunately, the live video and audio feed isn’t very high of quality, and can often be reduced to low quality if your internet connection isn’t very strong. Even so, the live casino dealers are inviting and allow you to enjoy the many different options of Live Casino. The high amount of Live Casino options also make it an enjoyable experience, with no more than 5 players per table, but always a table available. PlayTech offers live casino players an attractive amount of live Blackjack tables. You can also choose to play at the exclusive Paddy Power live blackjack tables, where the live dealers are dressed in the Paddy Power golden clothing and welcome you to the table and encourage you to take a seat at the table. These blackjack tables have different stakes and multiple opportunities of seats at the table. There are multiple tables of the following live blackjack games, which allows for many blackjack possibilities. The Live Roulette from PlayTech software provider at Paddy Power ensures that you have enough tables to play at, and also enough different kinds of games to play. There are, similar to live blackjack, multiple tables of the following variations of live roulette, so that there is always a table for you to play at. Next to live roulette and live blackjack games, PlayTech also offer live casino players live casino version of Poker, Hi-Lo, Baccarat, Sic Bo, and MultiGame. Live Poker offers 3 Card Brag and Odysseus Casino Hold’em. Live Hi-Lo is also offered with limits from £ 1 up to £ 1,000. Baccarat Live offers two Mythology Baccarat games, a Grand Baccarat game, Squeeze Baccarat, and Prestige Mini Baccarat. Luckily as with most other online betting platforms, Paddy Power Live Casino welcome bonus does not limit itself to sports betting. Paddy Power offer a live casino welcome bonus especially for live casino enthusiasts. As a newly registered players at Paddy Power, you can make use of the match bonus of 100% up to £ 100. You can activate this welcome bonus from a deposit starting off at £ 5. This welcome bonus is available to play on all live casino games, and contribute to the wagering requirements of 40 times. Do keep in mind that the wagering requirements and contribution depend on the live casino game, roulette has 100% contribution and 40 times wagering requirements, whereas blackjack has 20% contribution and 200 times wagering requirements. Payments made through Skrill, PayPal or Neteller do not qualify for this welcome bonus. Paddy Power offers certain temporary promotional offers. These offers often grant players cashback at a certain percentage. This entails that you receive a percentage of the amount that you’ve lost back in the live casino games. They furthermore also offer reload deposit bonuses especially for live casino players. Do make sure that you keep an eye on this page so that you don’t miss out on any exciting offers. Paddy Power offers all player a compatible mobile app that you can download for your iPhone as well as Android devices. You can also play live roulette or live blackjack at the same quality as that you’re used to whenever, and wherever. You can let them send you a free link via text message by entering your mobile numbers for a quicker access to the mobile live casino. Open to customers from UK & IRL. Wagering requirements (x50) apply, some games contribute less to the wagering requirement, some games contribute zero. Deposits made with e-wallets (Neteller, Moneybookers etc.) are not valid for this promotion. Golden Chips worth €1 each and hold no wagering requirements. Please see full T&Cs below for info. 24/7 Live Chat support, Email. Credit Cards, Debit Cards, Wire Transfer, PayPal, NETELLER, Skrill, Paysafecard, Entropay, Cheque.